In this article we introduce one of Onkyo´s successful amplifiers, the Onkyo A-7 Integrated Stereo Amplifier (the big brother of the Onkyo A-5). It is one of Onkyo´s great amplifiers from the 1970ies and definitely worth keeping or buying. 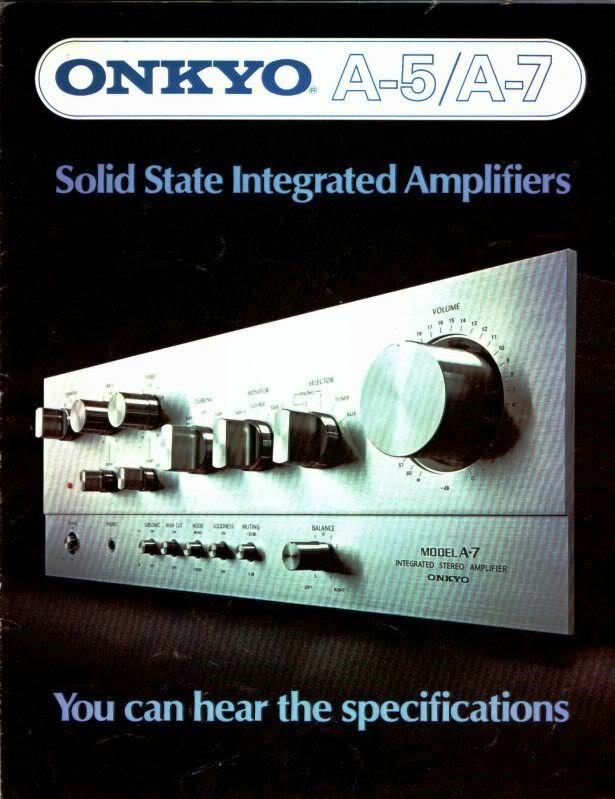 The Onkyo A-7 intergrated stereo amplifier is actually not just a simple amp, but consists of a pre-amplifier and an amplifier. If you are wondering what the difference of this is, let´s make it simple: An amp is solely a power source for speakers, which needs a separate preamp to switch sources and has no equalizer or controls. The A-7 does consist of both, amp and pre-amp, has 4 inputs, outputs and has an interface to manage all the settings. The A-7 is of astonishing weight, with its nearly 30 lbs. (13.5kg). If you are looking to buy the A-7 in used condition, be sure to test all its functions. If at all, damages should be minimal. Some acceptable flaws are typically broken lights or damages of potentiometers (i.e. to control the volume), if you know how to repair them. If you are interested in an older receiver or amplifier, be aware that it is normal that exposed connectors and metal contacts have oxidized over the years. We made good experiences with Hosa D5S6 DeoxIT Contact Cleaner , especially with equipment that has stood in storage rooms or garages for decades. Give it a try! First let me say that I really appreciate the sites and the effort supporting vintage stereo equipment. Although I own more modern equipment I still enjoy collecting and trading the 70's vintage equipment. I collect vintage electronics and mainly focus on 70's silver face. I have an A7 in excellent condition. It is one of the better if not best sounding unit in my collection. The 65 watts appears to be under rated as it will drive some of the more difficult speakers I have without any signs of stress or clipping. Highly recommended.